Got cows? The sport of cutting is super fun for both horse and rider. It’s a challenging dance, but cutting is a fun, fast-paced event that not only excites horse and rider, but also fires up a crowd of spectators. 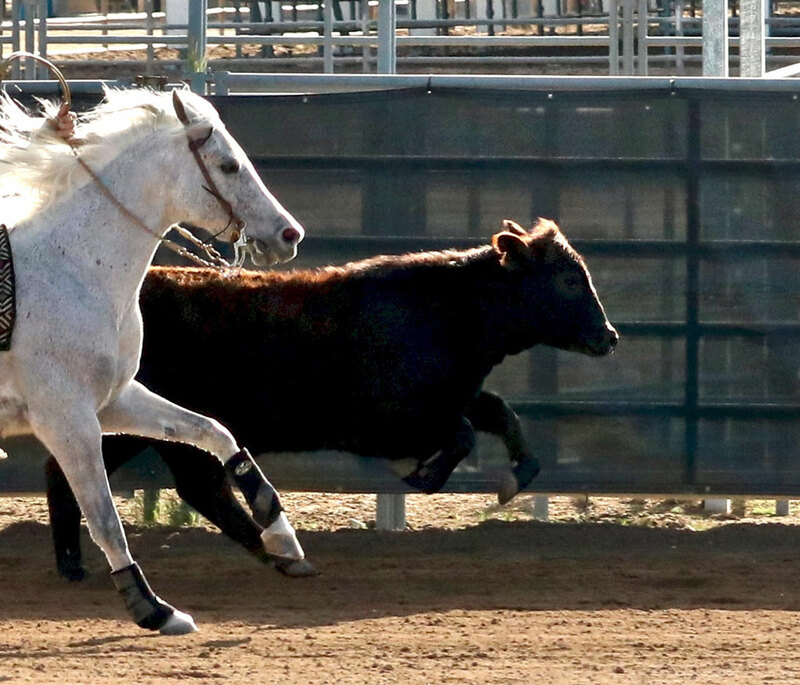 Dashing from side to side, Sidney Kahla’s gray gelding athletically keeps the black cow from getting back to the herd of cattle behind it. While it looks like 11-year-old Sidney is hanging on to the saddle horn with all her might, a closer look reveals a subtle shift in weight and leg to cue her horse. The sport of cutting is a timed event that only lasts for 2 minutes and 30 seconds. The horse and rider must separate a cow from a herd and keep it separated until the cow either stops moving or turns away. The process is repeated least twice, but preferably a rider cuts out three cows. Points are taken off if the rider picks up the reins and guides the horse while working the cow away from the herd, so feet are the only guidance. However, riders can hold the horn for balance. Sidney started the sport young. Sidney says that once you know the basics of riding, you can learn to cut on a trained horse. She rides a 12-year-old gelding named Peptos Playgun (“Gunner”). Sidney and Gunner practice several times a week with trainer Adam Cunningham to keep their skills sharp. Practice has paid off for Sidney, and she recently won the 2016 Grimes County Youth Ranch Cutting champion title. In 2015, she finished sixth in the American Cutting Horse Association’s youth division year-end results. She has shown competitively for two years, and shows in NCHA, ACHA and Stock Horse of Texas. Trainer Adam reminds riders that while cutting is a competitive sport, they should remember that the reason they ride is to have fun. “The biggest thing I can suggest is that parents get a horse that can take care of the kid to help build confidence,” he says. If you’d like to give cutting a try, grab the horn for a wild ride! Different associations offer cutting classes. Find out more!